Professor Morten Bennedsen gave his inaugural lecture as a Niels Bohr professor on October 10 at the University of Copenhagen, Department of Economics. Bennedsen is a professor at the French business school INSEAD. His main research area is family-owned companies. Although family-owned companies constitute as much as 90% of all companies in the world, there is still little knowledge about the characteristics of these companies. As a Niels Bohr professor at the University of Copenhagen, Bennedsen will lead the research project FAMBUSS, which will identify and systematically analyze the effect on company performance of several family-related assets such as political or family networks and cultural or family values. Christian Schultz, head of the Department of Economics, expressed great satisfaction with having a star researcher such as Bennedsen coming back to work at the department where his career began. Schultz also quoted from the very positive characterization of Bennedsen given by Nobel Laureate in Economics Oliver Hart as part of the review process for the Niels Bohr Professorship. 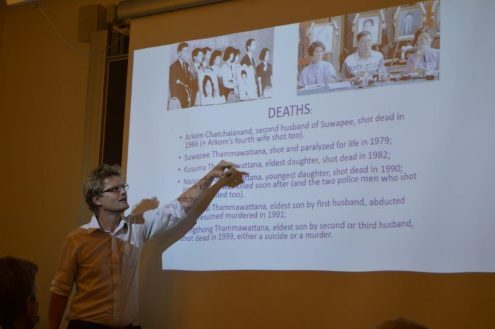 In his inaugural lecture, Bennedsen presented very illustrative cases and research results on the impact of death, illness and succession on the performance of family-owned companies. At the reception after the lecture, Liselotte Højgaard warmly welcomed Bennedsen.